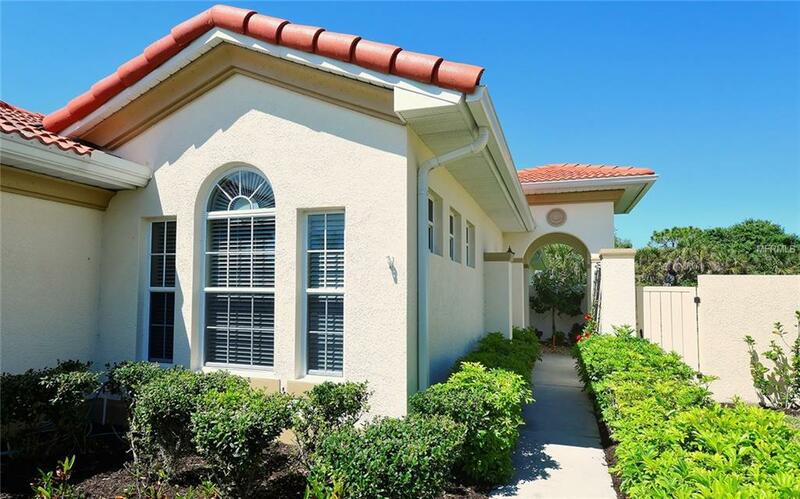 The quintessential Florida lifestyle awaits you in this Massari courtyard home with lovely preserve views from your lanai which has vinyl windows for all season comfort. This home features two bedrooms, two baths, den with French doors, open and bright kitchen living room combination with separate open dining area and two-car garage. Many improvements and updates include freshly painted exterior and interior, new carpet in owner's suite, new wood grain laminate in den and guest bedroom, new washer and dryer, motorized shades, custom valances, granite countertops and backsplash, tray ceiling, recessed lighting, custom closet organizers, garage shelving, updated landscaping and much more. The spacious owner's suite features pocketing doors to the bath which has dual sinks, granite countertop and large walk-in shower. Experience all that the Venetian Golf and River Club has to offer with many fine amenities including a championship 18-hole golf course, large heated community pool and lap pool, six Har-Tru tennis courts, a nature trail, a first-class fitness center and exercise room. There is also a poolside Tiki bar and fine dining at the River Club Restaurant. All of this and only a short drive to the best Gulf Coast beaches and attractions of downtown Venice.